Beevers 3', 5', 23', ? Bewilderment on the faces of Wokingham supporters changed to sheer disbelief as Horsham crashed to their heaviest ever Corinthian League defeat. 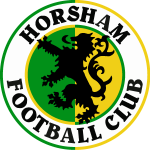 They just couldn’t believe that their team, fifth from bottom in the table, could so this to high and mighty Horsham. They had come prepared to see their young and sprightly team fight hard for victory but to see an avalanche of goals coming so quickly that they could hardly get their breath was totally unexpected. They rose to their feet and cheered as Wokingham, beating off Horsham’s opening attack, went ahead after fifty seconds when they went ahead after fifty seconds when left-back Norman Weller’s perfectly-placed free-kick was headed home by inside-right Trevor Smith. The cheers were prolonged for the second goal that came just over two minutes later as centre-forward Wally Beevers forced the ball home when the Horsham defence failed to clear. The first note of hysteria was starting to creep in as Beevers made it three in the fifth minutes from another perfectly-placed free-kick, this time from left-half Rodney Haider. But when Horsham centre-half Tony Lee, trying to clear anotehr first rate cross, cracked the ball into his own net they began to feel a little sorry for their opponents. After all, they didn’t really need a helping hand in this over generous way. But there was no time for sentiment in football and the home side promptly took their goals tally to five in the eighteenth minute, courtesy of Bryan Cox. And as if that wasn’t punishment enough for the visitors, Geoff Crowther was hurt in a tackle two minutes later and had to go off shortly afterwards, returning into the forward line with Stillwell taking his place in defence. The change made little difference for Wokingham continued to increase their lead to six in the twenty-third minute and to seven, shortly before half-time. Both were scored by Beevers, who brought his match total to four. As astonishing as the half-time scoreline was, there were perhaps mitigating circumstances. Horsham’s captain and right-half Billy Bell and leading scorer Mick Browning were absent playing for their county, Glyn Jones was playing for Brighton, Johnny Browning was injured, forwards Jock Mearns and ‘Charlie’ Chalaye were playing their first senior games for weeks, club stalwart Maurice Watts was a newcomer to the team, right-back Ron Hartley was on the right-wing, left-winger Dennis Stillwell had ‘flu and ‘Cogger’ Mobsby had an injured hand that prevented him from playing his usual combative game. Hartley was switched to right-back in the second half and the defence was strengthened in an instant. With Lee now much more cofident, Wokingham scored only once more through centre-half Roystone, who forced the ball home in a goalmouth melee. The nearest Horsham came to making the score look a little more respetcable was when Gordon New hit the crossbar and later headed narrowly wide from a Watts corner.